The small Gulf kingdom of Bahrain briefly came to global attention on 17 February following the brutal attack on pro-democracy campaigners camped in the Pearl Roundabout. The savage assault by Bahraini security forces on sleeping protestors killed five and catapulted the country to international prominence. Events in Libya subsequently diverted the media lens and gave Bahrain’s ruling Al-Khalifa dynasty a breathing space in which to assess the sudden emergence of mass opposition to their rule. Yet the outbreak of mass civil resistance in Bahrain has significant implications for the Gulf States as authoritarian rulers struggle to react to the challenges posed by newly-empowered citizenry. Across the region, traditional methods of co-opting opposition through the spread of wealth are manifestly failing to deter calls for political reform and substantive change. Ruling families are looking anxiously at Bahrain as the cycle of political contagion and regime repression moves inexorably toward the Gulf. To close observers of Bahrain it is unsurprising that the archipelago was the first place in the Gulf to feel the winds of change blowing so forcefully through the Middle East. The country has a long history of popular opposition to the Al-Khalifa dynasty rooted in policies of unequal and selective development. Periodic outbreaks of major social unrest culminated in a five-year uprising between 1994 and 1999. This was followed by a period of political reform after the present King Hamad bin Isa Al-Khalifa assumed power (initially as Emir) in 1999. In 2001, the draconian 1974 State Security Law that had provided cover for the suppression of political opposition and massive human rights violations (under the charge of a British national until 1998) was scrapped. Constitutional changes were laid out in a National Action Charter that was overwhelmingly approved by 98% of Bahrainis in a referendum on 14 February 2001. This paved the way for Bahrain to become a constitutional monarchy, at least on paper, and saw the return of an elected assembly in 2002, twenty-seven years after its suspension in 1975. Demotix / aldurazi. All rights reserved. The reforms initially promised much but ultimately delivered little. The King’s promise of a unicameral elected legislature was immediately diluted by the addition of an upper house of royal appointees. Low confidence in the sincerity of the political opening led to a range of political societies, spanning the ideological and religious spectrum, boycotting the 2002 election. Although most societies participated in the 2006 and 2010 elections, the former was marred by allegations of systematic fraud and gerrymandering while the latter followed a heavy-handed clampdown on opposition and human rights activists. Widespread accounts of arbitrary detention and allegations of torture signified the definitive end of the post-1999 political opening and a return to the repressive ways of the regime’s murky past. Meanwhile, socio-economic discontent was bubbling up, propelled by high levels of un- and under-employment, the inability of economic diversification to generate sufficient jobs or economic opportunities for Bahraini youth, and popular anger at perceived corruption at the heart of government. It was in this context of rising tension that Bahraini organisers planned a day of protest on 14 February. The date was symbolic as it marked the tenth anniversary of the referendum that approved the National Action Charter. It also followed in the wake of the popular uprisings that swept away the Ben Ali and Mubarak regimes in Tunisia and Egypt. The inspirational sight of largely non-violent demonstrations defying political suppression and refusing to submit to the hated security regimes that had kept dictatorial leaders in power for decades was transformative. Bahraini cafes that usually showed Lebanese music videos instead aired non-stop Al Jazeera coverage of the enormous demonstrations in Cairo’s Tahrir Square. Emboldened protestors voiced demands ahead of the 14 February day of protest for greater political freedom and equality for all Bahrainis. These targeted the regime’s policies of fomenting sectarian division to inhibit the emergence of any popular cross-community opposition movement. 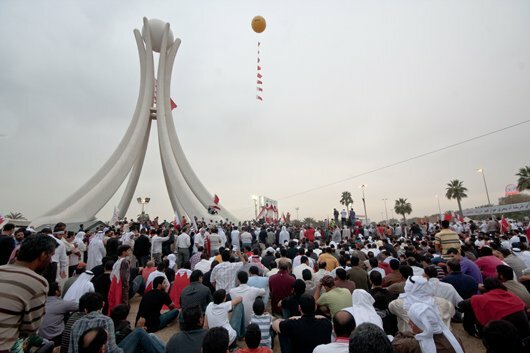 The security services’ takeover of Pearl Roundabout – which included further violent assaults on demonstrators on 18 and 19 February – did not lead to the crushing of dissenting voices. Neither did the regime’s belated decision to withdraw its security forces from Pearl Roundabout draw the sting from the demonstrations and herald a return to some form of normality. On the contrary, the stark contrast between their peaceful methods and the brute force of their opponents merely galvanised and emboldened the protestors. In the roundabout itself, a tent city sprang up featuring representatives from a very broad cross-section of Bahraini society. Social networking sites also played important roles in mobilising Bahraini youth and spreading inclusive messages intended to counter the regime’s divisive tactics. Underlining this initial stage of the protests was the regime’s miscalculated response to events, which then spiralled dangerously out of control to reach the point where its very survival was in jeopardy. 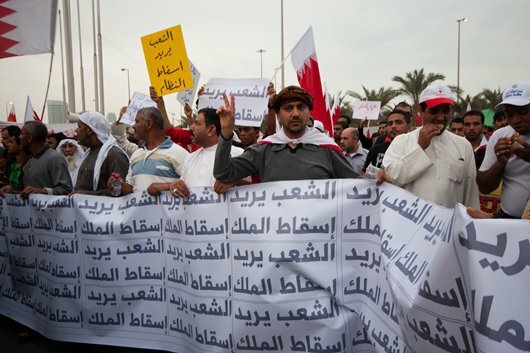 As the protests moved into a new post-clampdown phase, the regime reacted by sponsoring counter-demonstrations to try to fracture the social movement confronting them. Thousands of pro-government supporters gathered at the Al-Fateh Mosque in Juffair on 21 February to declare their support for the regime. Notably, they included large numbers of non-Bahraini expatriate workers and naturalised citizens whose livelihoods depend upon regime goodwill. In response, an estimated 100,000 Bahraini citizens participated in a pro-democracy march to the Pearl Roundabout the following day. This equated to almost 1 in 6 of all Bahrainis, but even this astonishing figure was dwarfed by the next pro-democracy march on 25 February. This was reportedly twice as large as two massive columns of protestors converged on the roundabout to demand the resignation of the Prime Minister, Khalifa bin Salman Al-Khalifa. The Government of Bahrain also offered incremental political concessions aimed at appeasing some of the protestors’ demands. This began with the release of political prisoners, including a group accused of plotting to overthrow the regime whose arrest in August 2010 had sparked the pre-election clampdown. Moreover, the exiled leader of the Haq Movement for Liberty and Democracy, Hasan Mushaima, returned to Bahrain after receiving a pardon for his alleged involvement in the coup attempt. A limited Cabinet reshuffle saw the replacement of the ministers of housing, electricity and water, cabinet affairs, and health. This was widely criticised by demonstrators as evidence that the government viewed the challenges facing it as economic and technocratic rather than political. The retention of a Prime Minister in office now for 40 years has become a flashpoint reinforcing oppositional scepticism about the government’s sincerity in engaging in serious dialogue on political reform. The risk facing the King is that the standoff becomes a zero-sum game if the opposition feel that political reforms within the current system simply cannot be obtained. To be sure, Crown Prince Salman bin Hamad Al-Khalifa has called for a national dialogue with the opposition, which in turn is finding it difficult to translate its street-unity into formal political demands acceptable to all its factions. The government’s shift away from its instinctive suppression of the demonstrations signals that advocates of a hard-line approach clustered around the Prime Minister may be losing ground to more pragmatic realists. The Crown Prince is known as a moderniser, whose Economic Development Board has directly addressed the socio-economic challenges facing Bahrain. The outcome of the power struggle between the obdurate Prime Minister and his more reform-minded great-nephew is important. It will influence whether this latest process of national dialogue results in substantive democratic changes to the balance between an unaccountable executive and the elected legislature. With its oil reserves measured in years rather than decades and facing the imminent yet difficult transition to a post-oil economy, Bahrainis simply cannot afford another wasted ten-year cycle of partial reform and renewed repression. Developments in Bahrain have a significance that far transcends the islands’ shoreline. This is due to two factors. The first is Bahrain’s role as a barometer of instability in the Gulf and a bellwether for charting the spread of the winds of change. Meanwhile, the second is the powerful geopolitical cross-currents that surround Bahrain and give events a regional and even international dimension. This leads, in turn, to a third implication for the Gulf States’ self-projection as global actors and oases of stability in an otherwise insecure region. Together, they mean that rulers and people across the Gulf are watching closely as events in Bahrain unfold. Saudi Arabia has most to lose from prolonged or major instability in Bahrain. From an ideological perspective, the ruling Al-Saud family in Riyadh is anxious to shore up its fellow ruling dynasty, using force if necessary to prevent serious challenges to its rule. This was the case during the uprising in the 1990s, when Saudi Minister of the Interior Prince Nayef bin Abdul-Aziz Al-Saud (now second deputy prime minister and third in line to the Saudi throne) visited Manama at the height of the unrest to proclaim that the security of Bahrain was inseparable from that of Saudi Arabia. This message that any uprising would not be allowed to succeed was bolstered by the dispatch of Saudi Arabian National Guard (SANG) troop carriers across the sixteen-mile causeway to pre-empt further trouble. Saudi influence over Bahrain is also exercised through the sharing of the Abu Safah oilfield, which provides the majority of Bahrain’s dwindling oil reserves and revenues. Yet the ideational damage to ruling families throughout the Gulf were one of their number to be forced into major concessions to popular opinion, still less ousted from power, is magnified in Saudi Arabia’s case. This arises from the fact that Bahrain lies offshore the coast of its oil-rich and Shiite-dominated Eastern Province. Like their Bahraini counterparts, Shiites in Saudi Arabia have long complained of systematic discrimination and marginalisation at the hands of state authorities. Deep frustration at the politics of uneven development caused a week of major unrest in 1979 centred on the oasis town of Qatif. Worryingly for Saudi officials, Qatif was again the scene for a sizeable protest on 24 February when up to 1000 protestors demanded the release of Shiite prisoners. 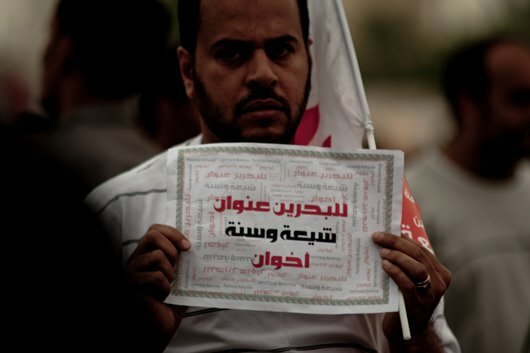 Saudi sensitivities were heightened by the near-simultaneous appearance of several petitions for political reform. This culminated in a statement released on several Saudi websites on 26 February, signed by 119 activists, intellectuals and businessmen and calling for a constitutional monarchy and elections to the Shura (Consultative) Council. The government responded by blocking the websites that carried the petition, but a Day of Anger has been called for 11 March and it increasingly appears the Kingdom will not escape the political contagion sweeping the region. Already, significant unrest has occurred elsewhere in the Gulf. In Kuwait, two days of disturbances occurred among the stateless (bedoon) peoples on 18-19 February. As in Bahrain, the authorities’ instinctive reaction was to suppress the protests with tear gas and riot police. Far more seriously, stone-throwing demonstrators in the Omani industrial port city of Sohar were fired upon by police on 27 February in an incident that killed up to six people. Again like Bahrain, the deaths galvanised the protests and led to heightened calls for political reform in one of the world’s few remaining absolute monarchies. Even the comparatively richer United Arab Emirates may not be immune, as Abu Dhabi’s overwhelming share of the federation’s wealth masks considerable divisions between the haves and the have-nots, particularly in the far less wealthy northern emirates. Only Qatar, with its happy combination of immense oil and gas riches and tiny citizen population, seems secure for the time being. Hence Al Jazeera’s willingness to document the revolutionary changes in the Middle East without concern for its host’s situation. The prospect of instability in this vital oil-producing area is especially unwelcome with oil prices upwards of $110 per barrel threatening the fragile economic recovery in Western markets. The Gulf is also strategically and militarily crucial to the United States as the linchpin of its regional security posture. The drawdown of combat troops from Iraq and ongoing dispute with Iran over its nuclear programme has further enhanced American reliance on its network of air, naval and logistical hubs in the Gulf States. Although then-US Secretary of State Condoleeza Rice acknowledged the failings of her country’s support for stability over democracy in her famous June 2005 Cairo speech, US officials would view any transformative changes to its Gulf partners with deep alarm. This was evident in the Obama administration’s very different responses to simultaneous protests in Bahrain and Iran. Officials performed an ungainly balancing act as they attempted to reconcile their calls for restraint in Bahrain with support for popular mobilisation and the right to protest in Iran. Caught in the geopolitical crossfire, any sizeable protests in the Gulf will be viewed with a great deal of concern in western (and fellow regional) capitals. Finally, developments in Bahrain highlight the dangers facing Gulf regimes that have carefully nurtured a global reputation as places to do business in an otherwise insecure region. The awarding of the 2022 World Cup to Qatar represents the highest-profile success of this strategy, yet it remains vulnerable to outside perceptions that their stability is a façade resting on unsteady foundations. Any outbreak of civil resistance in the Gulf is likely to provide succour to sceptics of the Gulf States’ global rise, particularly if ruling families prove unwilling or unable to accommodate their newly-empowered citizenry. In this regard, the Bahraini government’s lethal response to peaceful demonstrators inflicted immense damage on its international credibility and rapidly led to the cancellation of the Formula 1 Grand Prix due to occur on 13 March. This was a heavy blow that will reverberate across the region, not least by undermining the Gulf States’ aggressive self-branding as tourist-and investment-friendly destinations, largely through the attraction of top-class sporting events. In addition it risks jeopardising the lucrative MICE (meetings, incentives, conferences, exhibitions) tourism and trade fairs that have been such a factor in placing the Gulf States so firmly on the world map in recent years.